Building a new home but just can’t seem to understand all of that jibber jabber on the floor plans? The good news is that you’re not alone! They can be very confusing and make you feel as though you’re trying to crack a code! So hopefully these pointers will help ease the pain a little. Before we get into anything too serious though, what is a floor plan? A quick glance will tell you that it’s a 2D drawing providing you with a birds’ eye view into the house. But on a second glance you’ll notice that there’s so much more to it than that. A floor plan gives you the most information about a house, it show’s you anything from the type of the house, to the size, layout, and location of furniture. It can be difficult to visualise what your home will look like when looking at a floor plan, so my tip is put yourself in there and “walk” around the house, going from room to room, this will allow you to get a feel for your home and make sure that it flows nicely. Make sure that you take note of the size of the rooms in your current house and compare them with the dimensions for your future home. This will help give you a guide as to how big all rooms are and whether or not there will be enough space in each area. The next question is, what’s on a floor plan? A floor plan holds a lot of intricate details, this is what the builders look at when building your house after all. Whilst there are people who will be able to make basic sense of floor plans there’s still a lot of information to be deciphered. Below I’ve put together a quick explanation of the important features. The date, scale, initials, north point, etc. The title block may also provide you with a ‘key’ for all of the different/less common symbols that may appear on the drawings, along with the total floor area and floor area of certain parts of the house (in square metres), doing this is really useful for builders when they’re quoting a job as certain areas of the dwelling are cheaper to construct than others. The walls would have to be the most important part of a floor plan as they determine the size and shape of the house, and how the rooms are laid out. The thickness of the walls will differ depending on what form of construction you’ve chosen. Double brick walls will be thicker than a brick veneer home, just as a brick veneer home will have thicker walls than a timber weatherboard clad home. Doors in the house are shown on a floor plan to indicate the direction in which the door opens, and location of the doorknob. Windows are shown as an unfilled part of the wall. As there are so many different options and types of windows, a window schedule is provided to show a more detailed description of each window type. The floors on a floor plan tend to be shown textured, by using shading or certain hatches (lines), that indicate if the floor is timber, tiles, concrete, etc. 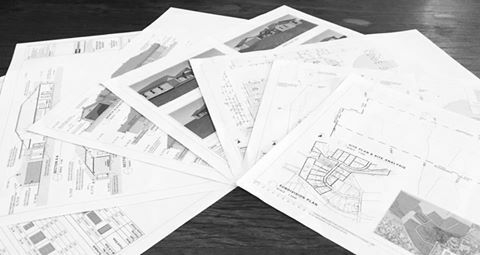 Floor plans must have a north point to show which direction the house is orientated, (This can make a big difference to the way your house will perform, in regards to heating and cooling, and natural light and ventilation). The north point will usually appear in the title block but can be seen on the plan itself in one of the corners. 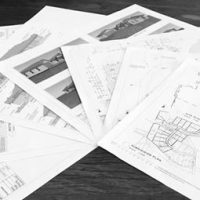 Hopefully this has been helpful and will assist you when flicking through house plans of your own or a friend’s.